Sharp's award-winning PN-R556 professional LCD monitor, gives you more options than ever to set up your digital signage in the most eye-catching ways possible. Not only can this monitor be suspended from a ceiling, it can also be installed face up, face down, or at a tilted angle. 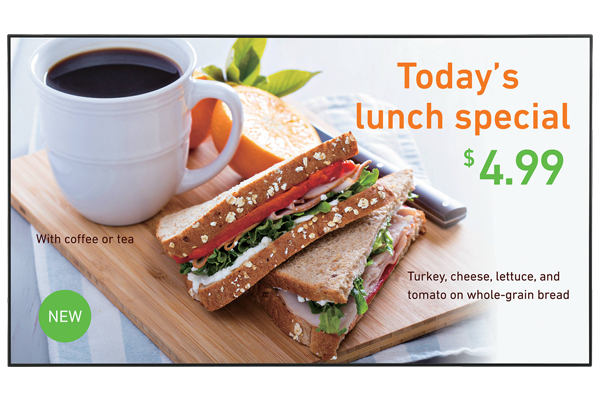 The 55" Class (54.6" diagonal) PN-R556 display offers such a wide variety of installation options, you'll be sure to find the ideal setup to match your location and signage needs. DisplayPort™ 1.2 connectivity comes standard, and the interface can be expanded with an optional HDBaseT™ 2.0 receiver board. The system is designed for increased convenience and flexibility as the PN-R556 monitor stylishly makes your key message even more visible to your intended target.